Historical aspects – or when was the sky falling? Chiemgau impact (hypothesis) is a term that denotes a meanwhile manifoldly proved meteorite impact that happened as an extraordinary event in prehistoric times (Bronze Age, Celtic era) in southeast Bavaria (Germany). A large cosmic body (a comet or an asteroid) hit the ground and left a big crater strewn field with all relevant impact evidence. This website focuses on all aspects of the related scientific research including reports and publications on geosciences, astronomy, archeology and science of history, but also on discussions of this spectacular research area. In the Wikipedia four-line article "Chiemgau impact hypothesis" this event is characterized as "an obsolete scientific theory" that has been raised "by a team of hobby-archaeologists". This is grossly deceptive and typifies the standpoint of a few obstinate opponents of the Chiemgau impact, hence taking their side and thwarting Wikipedia requirements. we in the following present some new results (Main Belt Comets, MBC; large impact crater strewn field in Argentina; Carancas, Peru, stony meteorite impact crater) referring to this group of themes. 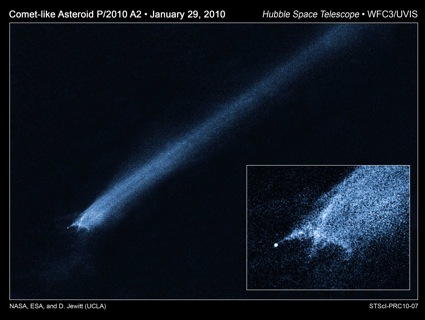 Loss of mass indicated by a tail (dust, gas, debris) and, like with comets, depending on the exposition to the sun. This points to a distinct content of volatiles in the form of ice under diverse cover. A time span of thousands of years for the comet-like behavior is assumed. Since the hydrogen isotopic ration of the terrestrial water is not compatible with the ratio so far measured for comets, it is internationally discussed whether the MBCs may have contributed to the delivery of water to Earth. A formation of the MBCs by collisions in the asteroid belt resulting in a release of ice to the surface is also being discussed. Bajada del Diablo, Argentina: a newly discovered large meteorite crater strewn field. Critics from Berlin (Museum of Natural History, Reimold et al. 2006) claim that according to computer simulations the strewn field of a fragmented meteorite can be very small only, not much more than 1 km wide. Indeed, the crater strewn fields of Kaalijarvi (Estonia), Ilumetsa (Estonia), Morasko (Poland), Sikhote-Alin (Russia), Henbury (Australia), Wabar (Saudi Arabia) are small the half axes being 0,5 – 2 km and up to 1 km, respectively. Perhaps the computer has not heard of this, but the strewn field of Campo del Cielo (Gran Chaco Gualamba, Chaco, Argentina) comprises 22 small craters at least (diameters from 5 to 103 m, up to 5 m deep) which are distributed over an area of minimum 19 km x 3 km. The recently discovered crater strewn field of Bajada del Diablo (Provincia de Chubut, Patagonia, Argentina) is even larger and measures 27 km x 15 km at least. The c. 100 craters have diameters between 60 m and 500 m and are up to 50 m deep. These data strongly remind of the Chiemgau meteorite crater strewn field, and the Argentine researchers explicitly refer to the Chiemgau impact and suggest – as does the CIRT – the projectile to have been a loosely bound asteroid (like the 253 Mathilde “rubble pile”) or a fragmented comet nucleus. Referring to the Chiemgau impact Reimold et al. (2006) declare the impossibility that small craters on the Earth’s surface can be produced by meteorites other than iron meteorites. Only one year later, object lesson was given when in Peru a stony meteorite produced a 13 m-diameter impact crater.